The Alligator Clip TP-AC5 is a small sized nickel plated steel alligator clip with color coding sleeve. The clip can be used on any measuring lead with 4 mm banana plugs. They can also be connected to a wire using a screw. The special construction allows to clamp both thin and thicker wires, up to 10 mm. 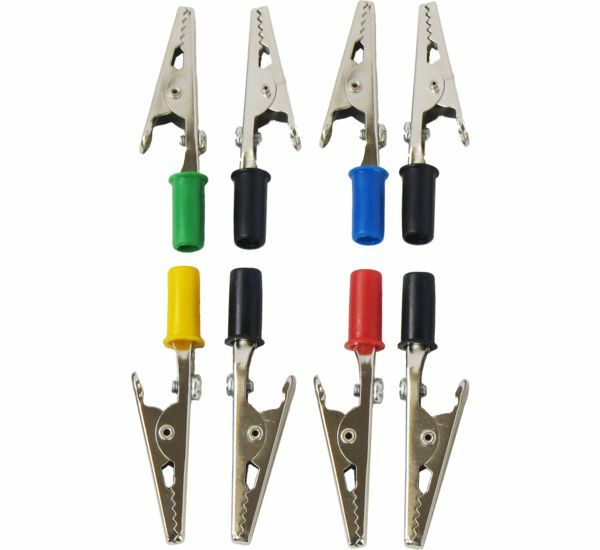 The Alligator Clip TP-AC5 - Set comes in a set containing 8 alligator clips: a green one, a blue one, a yellow one, a red one and four black ones. Alligator clips can also be ordered individually. The table below shows detailed specifications of the Alligator Clip TP-AC5.